A computed tomography (CT) scan was performed in a 64-year-old man with a history of end-stage renal failure to evaluate recent acute-on-chronic graft failure. To conserve remnant renal function, no intravenous contrast was administered. 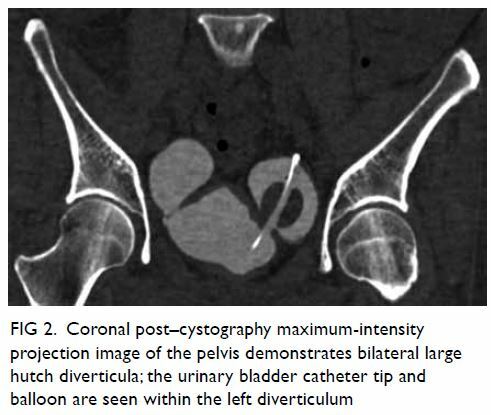 There was no hydronephrosis but the balloon of the indwelling Foley catheter was seen adjacent to but exterior to the bladder (Fig 1). No evidence of pneumoperitoneum was seen. Free fluid was noted in the pelvis, compatible with the history of peritoneal dialysis. The suspicion of perforated urinary bladder was conveyed to the referring physicians, and the patient was admitted for further evaluation. No abdominal distension, tenderness or guarding was elicited on physical examination. Urine output via the indwelling catheter was within normal limits. The patient was haemodynamically stable with no leukocytosis. Computed tomography cystography was performed: 20 mL of water-soluble contrast medium (Omnipaque 300) was diluted in 500 mL of normal saline. Transurethral perfusion of 250 mL of the prepared contrast medium was performed by free gravitational flow. 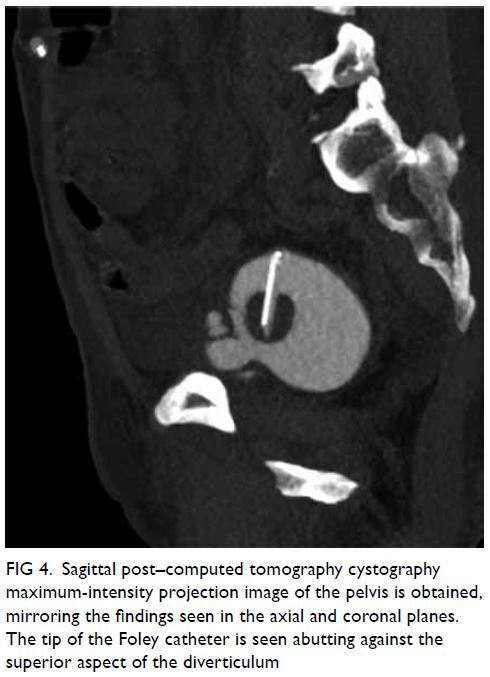 Pre-instillation and post-instillation CT cystography (5 minutes and delayed 10 minutes) was performed. No intravenous contrast was administered. Cross-sectional imaging revealed two large urinary bladder diverticula sited posteriorly, close to the native vesicoureteric junctions. The right diverticulum measured 3.8 × 4.6 cm with a 0.9-cm neck; the left diverticulum measured 4.5 × 5.8 cm with a 1.1-cm neck. On coronal images, a “Mickey-Mouse” appearance was noted, compatible with bilateral hutch diverticula. The inflated balloon of the urinary catheter was sited within the left diverticulum (Figs 2 3 4). The bladder contour was smooth. No evidence of intraperitoneal rupture was demonstrated. 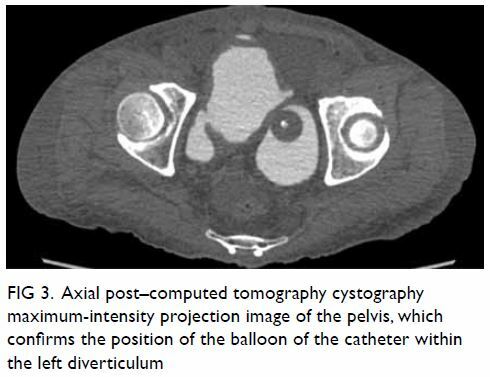 On pre-cystography images, the appearance had mimicked an externally sited catheter balloon due to the collapsed state of the bladder. Spontaneous bladder perforation is rare but potentially fatal. Most such cases present with features of peritonitis. Some possible aetiologies include gonorrhoeal infection, radiation therapy, diabetes mellitus, neurogenic bladder, bladder diverticula, and indwelling urinary catheter.1 2 As our patient was largely pain-free with minimal abdominal symptoms, the overall clinical evidence did not favour bladder rupture even though the CT images were alarming. Saline instillation and bedside ultrasound for rapid disposition of polytrauma patients and early diagnosis of bladder rupture has been described in the literature, with sensitivity reaching 90%.3 In cases with low clinical risk for perforation and when the patient is unfit for immediate CT, instillation of sterile saline to distend the bladder followed by ultrasound assessment provides a possible alternative to exclude bladder perforation. However, ultrasound results are highly operator-dependent and this procedure should be performed only in carefully selected patients. 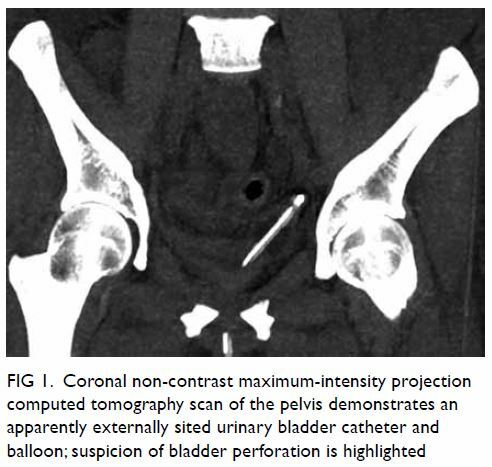 In experienced hands, following retrograde instillation of approximately 300 mL of sterile saline via the catheter, this imaging modality can be used to determine presence of ascites, evaluate the distension and configuration of the urinary bladder, look for bladder diverticula, and determine the position of the catheter balloon. This can be performed at the bedside for critically ill patients, involves no radiation and removes the risk of intravenous contrast-related anaphylaxis. All authors contributed to the concept, image acquisition, image and data interpretation, manuscript drafting and critical revision for important intellectual content. All authors had full access to the data, contributed to the study, approved the final version for publication, and take responsibility for its accuracy and integrity. Relevant patient consent was obtained for the purpose of this case study.